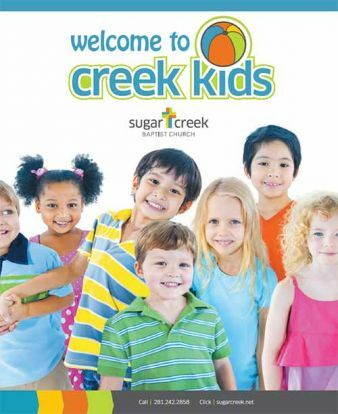 Creek Kids Children’s Ministry at Sugar Creek is a fun, safe place where your children ages birth to grade 5 learn about God and the Bible. Your kids will experience engaging, age-appropriate lessons each week that teach them about the Bible and what it means to follow Jesus. Through songs, games, interactive activities, and hands-on discovery, children learn how to apply the truth of the Bible to their daily lives. And, they’ll have a whole lot of fun all along the way! Sunday mornings at Missouri City are planned especially for your children, no matter their ages. When you come at 10 a.m. your family will be greeted at the door by friendly volunteers who will help you check in and find just the right spot for each child. Exciting things happen at Missouri City Creek Kids all year. No one wants to miss special Sunday Fun Days such as Snow Day, Sports Day, Pajama Day, Glow Day, and Breakfast in Bethlehem. Summer adventures include Vacation Bible School (at the Sugar Land campus), Pine Cove Camp in the City hosted by Sugar Creek, and Kids’ Camp at Carolina Creek Christian Camp for children having completed grades 3-5. We would be excited to have your child join us for fun and learning that will last a lifetime.